The largest of the body’s organs, the skin is made up of billions of cells. Like any other type of cells, skin cells require a certain amount of water in order to function properly and staying hydrated yields many benefits for the skin. In terms of appearance, fine lines, wrinkles and pores are more apparent on dehydrated skin. Drinking water hydrates and plumps skin cells, which can appear to fill in any lines. Because water increases circulation and blood flow, hydration aids in proper kidney function, which flushes impurities from the body and results in the ‘rosy glow’ associated with hydration. Getting enough water is an essential part of maintaining a healthy body, and the benefits can certainly be measured on the condition of our complexion. A wealth of health benefits are associated with the consumption of water, however, this alone will not actually affect the formation of acne. The source of acne is linked to a hormonal imbalance that affects the sebaceous glands, which produce the sebum, or oil, necessary to moisturize the skin. The solution for acne can be found in a systemic treatment such as AcnEase® which targets these over-productive glands and restores the balance of oil secretion. Because water cannot cure acne, a solution that reaches the source of the problem is necessary in combating breakouts. Our bodies are made up of approximately 60% water, and because we are constantly losing water throughout the day, it is important to replenish the supply as needed. Many people are not aware of just how much water they should be intaking on a daily basis. A safe suggestion has always been eight, 8-ounce glasses per day. However, it is important to consider other factors that may require you to drink more or less, such as your weight, the climate in which you live, and how often you exercise. A general rule of thumb is to drink a half ounce to an ounce of water for every pound you weigh. There are also several apps available to help calculate the right amount for you and remind you when to drink. It’s important to note that you should NEVER WAIT until you’re feeling thirsty to hydrate your body, but to maintain a continuous intake of water throughout the day. Most people aren’t aware of how little water they drink, which is why it’s important to keep track until you are in the habit of drinking consistently. One way to build a healthy habit is to get in the practice of drinking water as soon as you wake up. A cup of hot lemon water will not only hydrate your skin, but can jumpstart your metabolism and aid in detoxifying the liver. Lemon is a great way to add flavor and a boost of vitamin C , which can help reduce redness or dark spots on your complexion. Planning a new routine is most successful when we alter it to fit within our lifestyle. If you find yourself on the go often, carry a refillable sports bottle, or if you work from an office chair for a solid 8-hour stretch, be sure to keep a glass at your desk so it’s within easy reach. Like any other healthy routine, balance and consistency are the keys to success, so be sure to set yourself up to succeed with reasonable changes you’ll be sure to keep! As you can see, taking care of yourself from the inside out can result in changes that affect all areas of the body, including the skin. Among countless other benefits, drinking enough water can offer soft, supple skin, and even possibly reduce the flaking of dead skin cells that can clog pores. However, in order to experience long-term results, acne must be targeted at its source, and AcnEase®, is the best natural way to eliminate acne and break the acne cycle. 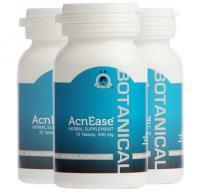 An all-natural, herbal acne treatment, AcnEase® works from within, stopping acne before it starts by counteracting the effects of hormonal imbalance and the overproduction of sebum. Designed to work together to address and treat the cause of acne, all herbs used to make AcnEase® are of the highest quality, and have been extensively tested and proven safe in clinical trials. Our 100% botanical ingredient based treatment has a 96% proven success rate, with zero side effects, and can be safely used by anyone. We want to hear from you! How much water do you drink on a daily basis? Do you feel like it improves the quality of your skin? Any tips or tricks for consistent drinking? Tell us in the comments below!